I originally heard of HPOL from LolTradez way back in 2011 here. It has also been written up in VIC. A friend of mine and I also took a look and this is what we found. Harris Interactive Inc. is a company that provides market research and polling services. The company is a small player in a pretty big market. The company is in turnaround mode. The CEO (and senior management team) seem to be executing, and this makes for an interesting situation. The CEO (Angrisani) came in 2011. He has done a good job of cutting money losing businesses and realigning the incentives for the company’s sales team. This has led to a slow deterioration in sales, but improved margins. The cut in money losing businesses is done (or near done) and the realignment of sales team incentives should also be nearly complete. The next phase of the turnaround plan is to grow the top line with new products or seeking new customers. This phase of the turnaround is currently being implemented, though it has seen some challenges. And this makes sense since it is the part of the turnaround that requires the most external factors to be right. Don’t get me wrong, when I say “challenges”, I mean that it hasn’t been exactly as planned. But it’s not like we are talking about existing customer margin deterioration or the need to raise capital. Customers are a little reluctant to spend. The CEO has lead the turnaround of several businesses (and eventual sale). I think that is the end goal for him with HPOL. This is obvious from the CEO’s website here. 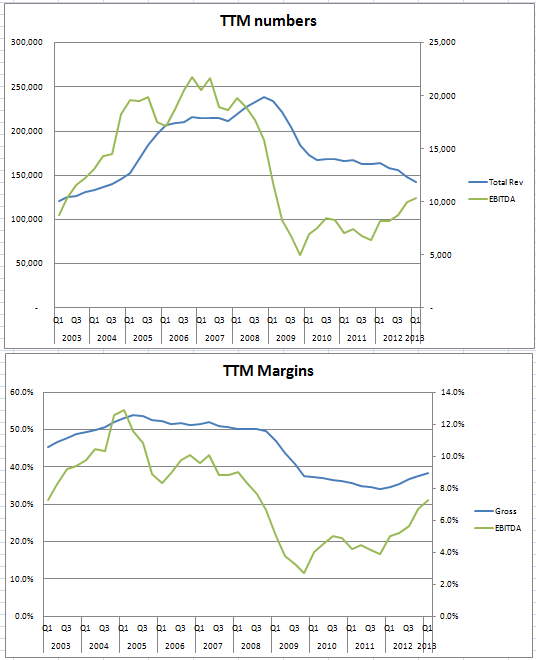 The incentives right now (in relation to his variable compensation) are for adjusted EBITDA margins and/or share price. Having said that there is only so much blood to bleed from the cost cutting stone. Top line growth needs to happen in order for multiple expansion in the share price, at least that’s my opinion. HPOL is a small fish in a large pond. The CEO believes that HPOL can compete with bigger players in certain markets. This seems to be the case. The product/service offered by HPOL is very discretionary. In rosy economic times HPOL will likely earn large sums on their invested capital (+25%). In weak times, they are likely to operate at a loss as the top line will deteriorate quickly. The business does not require a ton of capital to earn money, hence the high ROC. HPOL has said they are aiming for 10% Ebitda margins (average throughout the cycle). This seems plausible as HPOL’s peers are already doing this for the most part. Here’s were things get interesting. Current EV/Rev is 0.50, where peers trade at around 1-1.5 EV/Rev. If we keep current revenue and apply our 10% ebitda margins we get 5.15 Ev/ebitda, if we assume a modest uptick in revenue (going from 142 mil to 155 mil) we get 4.75 ev/ebitda. To be fair 6.5-8x ev/ebitda is likely a fair price for HPOL on a run rate basis. Either way there seems to be upside. The use of adjusted ebidta may be fine for variable compensation measures, but it usually lacks the expense of stock options (which is a real expense that needs to be considered). The current CEO owns 2% of the shares outstanding. Though it’s something, I would like the CEO’s to be vested even heavier in a turnaround. As previously mentioned, the service provided is very cyclical. This by itself isn’t a bad thing, but we have now had 4 years of a growing economy and the perpetual “Bernanke put” is ingrained in almost everyone’s thought process. This makes me nervous as there is very little talk of risk in the marketplace. Similar to the previous point, I am having a tough time determining what amount of the CEO’s success is due to his execution and how much is due to the economy improving. I don’t want to take anything away from the progress that has been made, but I wonder if it would have been done if it was during a recession. Regardless of the risks I identified, the company is heading in the right direction from what I can see. I am just a little hesitant to pay for it. That’s the issue with turnarounds, once it looks like the company has turned the corner, you aren’t always left with a cheap share price. Either way HPOL would not ever be a core holding. So I will take a pass for now. I would be interested if we see well under $1.00. I would be remiss if I didn’t mention LolTradez again as he was nice enough to send an email with his thoughts which were in alignment with my own. Disclosure: The author does not have a position in HPOL.